Love dinosaurs? What child doesn't? And this one is a fun dinosaur, with a party hat and a smile of anticipation! Get ready for fun with this cute little guy and his bright dinosaur dots. All you add is the words… and the birthday party. 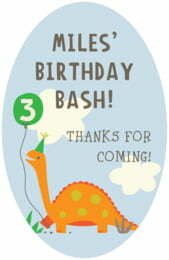 Customize your Dinosaur baby labels and stickers today! 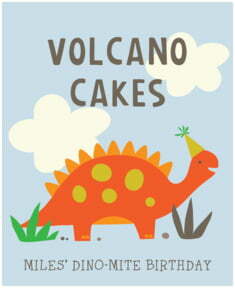 Dinosaur baby labels are printed on your choice of coated paper or waterproof vinyl label stock. 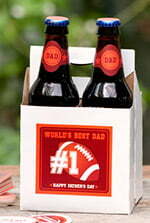 These self-adhesive labels print with fine detail and rich color. 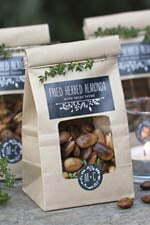 The light colors are soft and gentle, while the bright colors are luscious and juicy. Baby labels come in many different shapes and sizes for their many different uses (including bottled water labels and a label shape devoted to text for you to tell your baby's special story), and they are easy to apply. 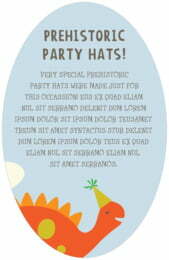 Select a Dinosaur baby label shape from above to get started!